This week I’m focusing, once again, on some of the fantastic local products that are available in store at Fresh Choice Nelson. 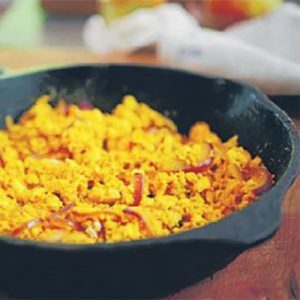 I want to share with you a savoury recipe that’s perfect for a filling breakfast. I’m including local products from The Soy Works, who use non-GMO NZ grown soy beans, Village Green and Urban Hippie. This scramble is great on toast. If you’re short on time in the evening, it also goes really well with fresh local greens and quinoa for dinner. Serves 2, preparation time 5 minutes, cooking time 10 minutes. Thinly slice the onion, and place it in a small frying pan with the oil. Saute until soft. Add the minced garlic and saute for a further minute. Finely crumble the tofu and add it to the pan, along with the turmeric, mustard and miso. Saute the mixture for five to ten minutes, until most of the moisture has evaporated and the tofu starts to brown. Taste and season with salt and pepper. Serve on Dovedale turmeric toast with a side of sauteed spinach. Next time you are at Fresh Choice Nelson, make sure you keep an eye out for all the other wonderful local products on the shelves. Just look for the yellow 200km sign to discover a whole world of fantastic flavour, from right here in our own backyard.